Both groups lost ~11% of their initial weight at 6 and 12 months and then regained, achieving a weight loss of ~7% at 24 months. 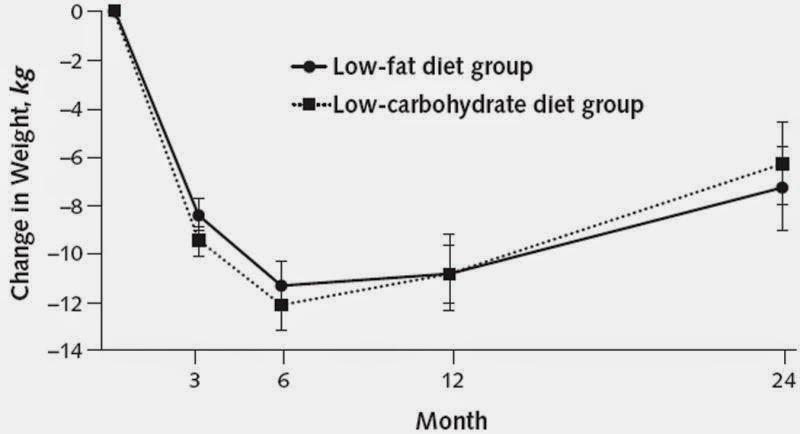 There were no significant differences in weight loss between the groups at any time point except for greater weight loss in the low carb group at 3 months (table 2). The changes in blood lipids were largely what you would expect: the low carb group had a greater increase in HDL-C at all time points and had had greater reductions in triglycerides at 3, 6 and 12 months. 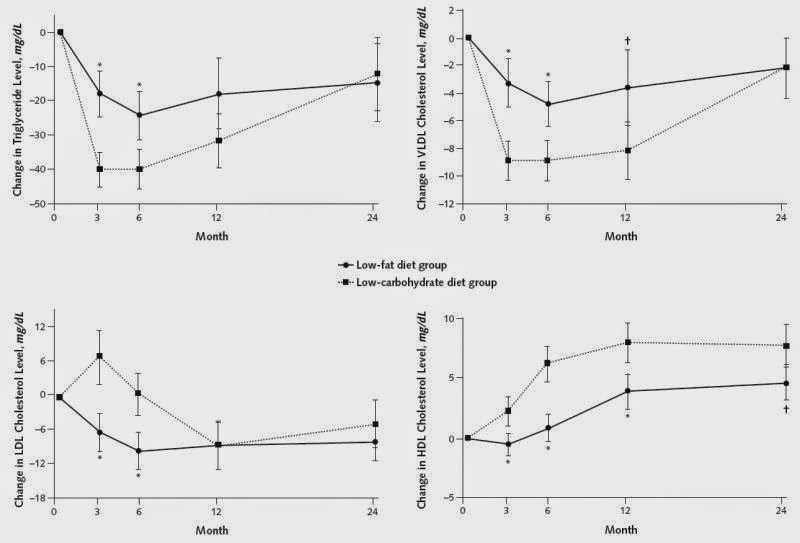 LDL-C decreased in the low fat group whereas LDL-C increased in the low carb group at 3 months, was back to normal at 6 months and was lower at 12 and 24 months. The lack of difference between the groups in LDL-C and triglycerides at 24 months is probably due to adherence (table 2). Both groups had reductions in systolic and diastolic blood pressure and the low carb group and greater reductions in diastolic blood pressure at 3, 6 and 24 months. There were no differences between the groups at any time point regarding bone mineral density in the spine and hip, lean mass lost and fat mass lost (table 2).